Accommodation in City Center hotels everywhere. Welcome to the capital city of Malaysia – Kuala Lumpur! On arrival at KLIA airport, please collect your luggage and head towards the exit. Plan Journeys representative is waiting outside immigrations, after meet and greet board your vehicle and we will transfer you to Genting Highlands – City of Entertainment, en route we will take a photo stop at the Batu Caves, followed by the cable car ride on Genting Skyway. You will enjoy the breathtaking view on board the cable car and arrive at the mountain peak in style. Check in your hotel and relax. Later you have ample time to enjoy in First World Indoor Theme Park, which offers many rides and entertainment spots for the whole family along with Snow World - featuring a winter downtown and a perfect place to have fun. Overnight accommodation at your hotel in Genting. Breakfast in your hotel in Genting and you are free to take a stroll around the Genting Highland to enjoy the scenic view. Later,check out and board your vehicle to proceed to the city of Kuala Lumpur. On arrival, check in your hotel in Kuala Lumpur and relax. In the evening you have time to go for the optional tour of KL by Night to enjoy the illuminated city’s landmarks and shopping markets and malls or you can yourself visit China Townor Bukit Bintang shopping area and enjoy your evening there. Overnight accommodation at your hotel in Kuala Lumpur. Today after breakfast in your hotel in Kuala Lumpur, we will take you to the city tour of Kuala Lumpur, which includes photo stop at Petronas Towers, followed by visits to Merdeka Square, National Monument and a visit to the National Museum. You will also get a chance for a photo stop at King’s Palace and National Mosque, etc. later if time permits, we will visit a handicraft showroom where you can see and shop for Batik printed fabrics and paintings. We will also visit a Chocolate factory, where you will witness the making of delicious chocolates and can buy the ones you like. Later in the afternoon you can take the optional tour of KL Bird Park or Sunway Lagoon theme park. In the evening, you can pay a visit to Menara KL – The Kuala Lumpur Tower and have your dinner there. Overnight accommodation at your hotel in Kuala Lumpur. Breakfast in your hotel in Kuala Lumpur, later check out and proceed to the airport to board your flight to Singapore. On arrival at Changi International airport,collect your luggage and meet Plan Journeys representative who will assist you to transfer to your pre booked hotel in Singapore. Check in and relax. Later in the evening, we will visit Night Safari in Singapore and see the animals living in their natural habitat during the nighttime. Watch Creatures of the Night show, hop on hop off a tram or take one of the many walking trails here. Later in the night come back to your hotel. Overnight accommodation at your hotel in Singapore. Morning breakfast in your hotel and get ready for a funfilled day, starting with city tour of Singapore, which includes a panoramicride within the city and cover Little India, China Town, Orchard Street, etc.We will also take stops for photo opportunities at the icon of Singapore – The Merlion and at Singapore flyer, followed by other sights of Singapore like Parliament House, City Hall, Supreme Court, etc. later in the afternoon we will visit Sentosa and enter in style by the cable car. Inside Sentosa, you can hopon hop off the comfortable buses and beach trams to get connected with the various attractions here. Your Sentosa package includes a visit to the Underwater World Singapore followed by Dolphin Show at Dolphin Lagoon and later we will go for the best highlight of the day and watch Wings of Time show, a brilliant combination of water, laser and fire effects. Overnight accommodation at your hotel in Singapore. After breakfast the day is reserved for individual activities or you can go for one of the many optional tours available with Plan Journeys. You can visit Jurong Bird Park in the morning and witness the marvelous beauty of birds from all over the world or go for the full day tour of Universal Studios Singapore and experience the mind-blowing rides, amazing shows and attractions. If you want to go for the last minute shopping in Singapore try the famous Mustafa Shopping Centre, Far East Plaza or at branded boutique shops at Orchard street. 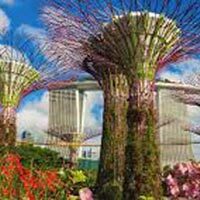 You can also go for the Garden by the Bay tour and enjoy its two climate conservatories – Flower Dome and Cloud Forest. Overnight accommodation at your hotel in Singapore. Today after breakfast morning is free for you, relax in your hotel. Later check out and we will transfer you to the airport. Board your flight and come back to you home. We hope that you have enjoyed your Singapore and Malaysia tour with Plan Journeys and we request you to please share your kind feedback in order to let us serve you better for your future travel with us.